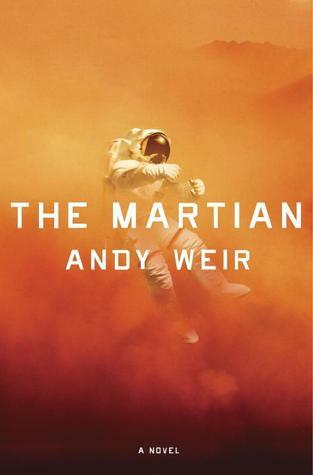 I read The Martian, which surprises me, because I don’t usually have an interest in space travel, but the reviews I was reading about this book were making me curious. Well, I liked it. It was a lot of fun to read. I learned some things, laughed a little, and spent some time on the edge of my seat. If you don’t already know, The Martian is about an astronaut who gets left behind on Mars, accidentally. It’s about his desire to live, and the efforts of the people on Earth to rescue him before it’s too late. This guy is smart. I didn’t know there were people out there who were this smart. And the book is full of others just like him, including the man who wrote it. His ability to come up with this story and all the crazy McGyver-type moves that happen boggles my mind. I tried to follow all the science-y tech-talk (I have a science degree, after all), but I had to just let some of it go over my head. If I had to point out a couple of things going against this book, one would be that there was almost too much technical stuff. Everything that was done was explained meticulously, which is partly extremely impressive, but sometimes it felt like too much to read about. Because I’m the type of reader who likes to get every word, it slowed me down quite a bit trying to picture all the equipment adjustments and repairs and checks that were constantly being done. However, some people might revel in all that stuff, or find it easy to skim over. One other slight annoyance would have to be the narrator. At first, I thought his upbeat voice was over the top, but I got used to it, and have decided that the tone of the book would be much different without him. Probably not as much fun. If you like survival stories, or stories that involve solving puzzles, then you will definitely like this one (I’m thinking of you, Dad!). There’s a reason it is getting all those positive reviews. One thing is for sure; it made me glad I am not an astronaut and I don’t work for NASA. Three’s Company gets a few mentions. I loved that show when I was young and not allowed to watch it. Commander Lewis is a woman! Mark listened to a lot of Disco music while on Mars (because that was all that was available to him), and he chose his theme song; Stayin’ Alive by the Bee Gees. The fifth one (meal) is reserved for the day I launch. It’s labelled “Last Meal”. Maybe that’s not such a good name. If ruining the only religious icon I have (a cross) leaves me vulnerable to Martian vampires, I’ll have to risk it. The Hab is a shell of its former self. I’ve robbed it of all critical components and a big chunk of its canvas. I’ve looted that poor Hab for everything it could give me, and in return it’s kept me alive for a year and a half. It’s like the Giving Tree. I’m in the middle of a bunch of craters that form a triangle. I’m calling it the Watney triangle because after what I’ve been through, stuff on Mars should be named after me. Who knows how far south the storm goes? Well, NASA probably knows. And the news stations back on Earth are probably showing it. And there’s probably a website like http://www.watch-mark-watney-die.com. So there’s like a hundred million people or so who know exactly how far south it goes. Although this book is primarily a survival adventure story, there is also one big message that shines through. …every human being has a basic instinct to help each other out. It might not seem that way sometimes, but it’s true. If a hiker gets lost in the mountains, people will coordinate a search. If a train crashes, people will line up to give blood. If an earthquake levels a city, people all over the world will send emergency supplies. This is so fundamentally human that it’s found in every culture without exception. Yes, there are assholes who just don’t care, but they’re massively outnumbered by the people who do. Do any of you have a good story to share about this basic human instinct? I’m one of the very few people who just couldn’t get over the upbeat tone on this one and I definitely agree with you on the overload of the technical stuff, though I appreciate the author’s clear knowledge. I tried to look at it positively by imagining how dull it might have been if the protagonist had been a pessimist. Actually, it might have just been short. You would need to be a special kind of person to survive on Mars by yourself for 18 months. I’m so glad you reviewed this Naomi, as it made me remember I promised my husband I would pick it up for him, though now it makes me want to read it, too. I think the message about the basic human instinct to help each other is really lovely and true to life. When my grandfather’s house was carried off by Hurricane Katrina and he had to move to another state with nothing left, his new congregation pitched in and gave him clothes, kitchen utensils, everything you could think of. When my friend’s husband was hit by a speeding car, all our friends came together for months after and kept a meal train going to help them with the little things they no longer had time to deal with (understandably so). There are those people who don’t care, but there are so many people who do and it’s those people who make humanity shine. So true! Thanks for sharing your stories. It’s comforting to know that people are so willing to help. Those sound like some good quotes, I might pick this book up just based on those. The technical stuff would bug me a little, though I think many authors fall into the trap of putting way too much of their research into their novels, so much so that they lose the story a bit. Kirt wrote a post about it awhile ago I think, something about the research rabbit hole? Despite being a bit over th top at times, there were definitely some good one-liners that made me laugh. Maybe you’d be good at skimming over the technical stuff. This has been on my list for a while, and I’ve heard some of the same snags from others about the technical language and quirky narrator. Still might be worth a try, though! Thanks for the review. It is definitely still worth a try! I did really like it- just wanted to point out the things I didn’t love so people trying it would know the possible drawbacks. There were so many great things about it, too! I loved The Martian! Read it last month but my review/interview are tied to Mother’s Day — I’m glad the book is getting out there! Now I’m curious to see how it’s tied to Mother’s Day! I’ve heard this book is really good, thank you for pointing out the abundance of technical language. I feel like it will require a certain mood on my part to get into it. Glad you liked the book. Someone once said to give a book fifty pages. Then, if you don’t like it, you can put it down. I gave this fifty-one. There was so much technical information that the story got lost. I felt that it had gotten to the point where the author was just showing off. Down the road I think it will be a good movie if the screenwriter focuses on the story. Don’t know whether you would call it a survival story but I loved “The Razor’s Edge” by Somerset Maugham. Seemed to me that it was a spiritual survival story. I just looked it up, and it sounds good, Just added it to the list. Thanks for the suggestion! There was a whole lot of technical stuff! Luckily for me, some of it was interesting. If none of it had been, it probably would have put me off, too. I’ve got to hand it to him, though, that guy is smart! How did I miss this one! Anyway, great review. I would be bogged down by the technical details as well. Do you consider it an “easy” read over all? I am wondering if I should read this to/with my son (11 years old; he may like the scientific descriptions). Except for some of the science-y stuff, I thought it was a pretty easy read. You can always skim over the technical stuff, if you want. I don’t think you would miss anything. Great review Naomi. Your balanced description of the deceptively smart writing in this book with the Weir’s ambitious technical proof for every plot progression is bang on. The humorous vernacular of Mark’s diary entries is handled really well I thought and that ultimately draws you into all the fantastic stuff that he must find a way to survive. It certainly isn’t high literature but it’s not pulp either – made for an enjoyable couple of days reading at the cottage this summer. I recommend it too. I was surprised by how much I liked this book. I don’t usually go for space books. Glad you liked it, too. And, thanks for the kind words!